The use of concept maps as an integral part of student’s course work is equipping students with a powerful learning and study tool. The introduction of concept mapping in the practical work appears to have facilitated the retention and understanding of chemical concepts. the concepts already present in a student’s mind (initial concepts). The conceptual linkages between the concepts (context). The evolution that takes place as a consequence of teaching/learning activities (conceptual change). The Select and Fill-in concept map which is analogous to the multiple choice model, was the preferred concept mapping technique (65%) as compared to the four other strategies namely advanced organizer, Fill-in, Selected term and Seeded term. Likewise, a high percentage of success was recorded in this exercise, which further corroborates the above statement. Student-generated maps were seen to have greater descriptors than the Fill-in maps. Misconception and alternative conception were easily discovered in such maps where students had no clues about the choice of links and propositions. Thus student-generated maps were more discriminating that the Fill-in maps and also explains the dislike of the students for such exercises where they were engaged into intense active thinking. Language is a vital tool in the construction and organization of ideas. Without appropriate vocabulary, pupils find it difficult to express their ideas in a logical manner. 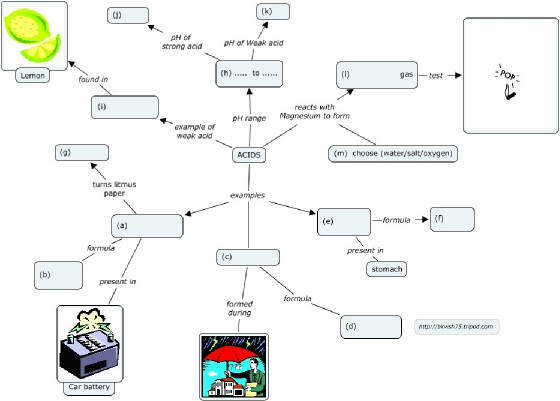 A concept map can highlight gaps in pupils’ vocabulary. Whilst the concept map is an excellent visual tool for describing pupils’ ideas, the teacher still has a vital role in supporting and guiding this activity. This is particularly important in the early stages of a map’s development where students must be aware of the hierarchical organization of concepts. Modelling is another crucial tool that should be used during the introduction of concept mapping. In fact, students should be aware of the different models of concept mapping in order to be able to reproduce similar structures in class. The absence of crosslinks in the student-generated concept maps indicate that the learners were not sufficiently exposed to a myriad of models which could have quaked their imagination. Thus, one of the fundamental stage of concept mapping, remains the initial period where students need to have a holistic view of what a concept map could be. Concept maps can be used both as an instructional and learning tool during practical work. The advanced organizer can be displayed prior to the lab work and the teacher should be instrumental to drive through the important points as well as the proceedings of the exercise. Students found it easier to refer to the their concept maps rather than their textbooks during the practical work. 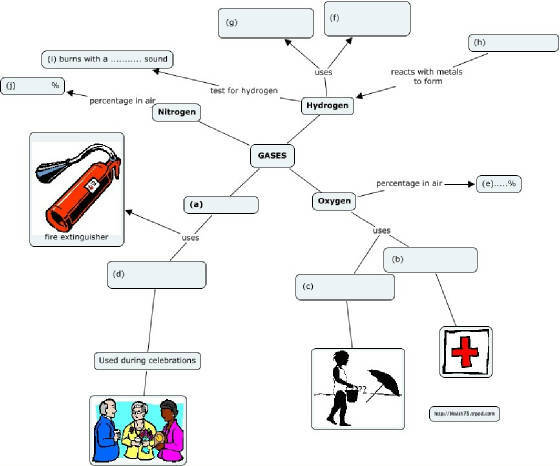 A wide majority of students requested the presence of diagrams in the concept maps – whether this is a key element for understanding remains to be validated. Students prefer to fill-in their concept maps during or just after their practical works. A majority of students stated that this helped them to differentiate between the concepts and also recall about the whole process of their practical work. The process of drawing a concept map makes the task of learning more active. It can be used as a way to encourage peer tutoring. The areas of the map in which the members of the group do not agree can be identified and discussed. As Novak says ”Concept map……is no magic bullet”, no “quick fix” for classroom where rote learning predominates and use of the maps can be successful only by adopting a constructivist approach to education. The present study corroborates this view and confirms that the use of concept map in practical work as an integrated approach, improves learning in Chemistry. Concept mapping should be introduced as a multi-disciplinary instrument as from the lower secondary level. Its use should not only be limited to teaching but also learning and assessment. Teachers should use the different variations of the concept mapping techniques accordingly to the needs of the students. Where possible, group work should be favoured since it promotes individual interactions and peer tutoring. Group concept maps should preferably be done on the much larger A3 sheet such that all concepts can be holistically displayed. Though the Fill-in concept map models were the favourite of learners, student-generated maps should be experimented at different stages of teaching. They are particularly valuable at depicting pupils misconceptions and understanding. The introductory classes of concept mapping are highly influential to the success of the latter. Students need plenty of time to be exposed to a variety of concept maps which model crosslinks and interrelatedness of concepts. The first lesson on concept maps should be based on a familiar topics (such as hobbies) which is accessible to all ability groups. Integrated approaches of teaching such as concept mapping/practical work, should form part of the core teaching methods in science subjects. The use of textbooks which promote identical strategies, should be used in lower classes. Novel variations in the field of concept mapping namely concept cones(Kinchin,1999) and concept cartoons(Kinchin,2000), open up broad avenues of research in this field. Further investigations can be undertaken in these areas so as to promote meaningful learning and improve curriculum development. School Science Review, 63: 758-70. Ghaye, A.L and Robinson E.G (1989), Concept maps and children’s thinking: a constructivist approach. In language and learning in the teaching of geography, ed. Slater, F. pp115-139. London: Routledge. Head, J. (1982). “What can psychology contribute to science education?”, School Science Review. 63 (225): 63, 1-42.
work in school science”, Studies in Science Education, 22: 85-142. Jones, A., Simon, S., Black, P. J., Fairbrother, R. W and Watson, J. R. (1992). Open Work in Science: Development of Investigations in Schools. Hatfield: Association for Science Education. Education, Vol. 12, p195-203 and 205-16. Kerr, J. E ,(1964) ,Practical Work in School Science. Leicester: Leicester University Press. Tasmanian schools”, Australian Science Teachers Journal, 29(2), 5-9. Millar, R. and Driver, R. (1991). “Beyond process”. Studies in Science Education, Vol. 14, 33- 62. Mintzes, J.J., Wandersee,J.H. & Novak, J.D. (1998). Teaching science for understanding: A human constructivist view. San Diego, CA: Academic Press. Novak, J.D; Gowin, D.B, (1984). Learning How to Learn; Cambridge University. Novak, J. D., & Musonda, D. (1991). “A twelve-year longitudinal study of science concept learning.” American Educational Research Journal, 28(1), 117-153. Wandersee, J.H. (1990). “Concept mapping and the cartography of cognition.” Journal of Research in Science Teaching, 27(10): 923-936.